The CoolKrew 15cm Glass Pipe with Stand is a great little pipe that is a perfect fit for anyone’s glassware collection. Constructed with borosilicate glass, the CoolKrew Glass Pipe with Stand is built to last and also includes a detachable metal bowl with pipe screen to provide a smooth smoke every time. 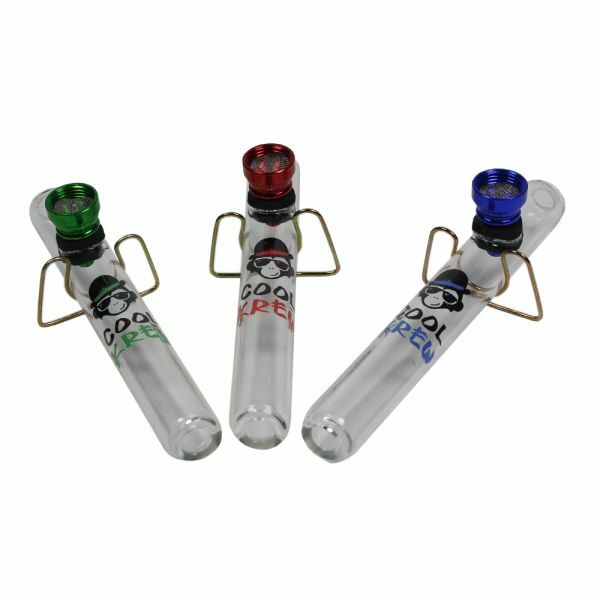 Featuring the CoolKrew logo and handy stand, this glass pipe is great value at just £6.99 and is available in three colours, red, blue and green. Why not add some extra pipe screens and some pipe cleaners to keep your CoolKrew pipe in tip top condition. If you’re looking for something a bit different, why not check out our full range of glass pipes here. Do you believe in aliens, we are sure that many people do, but whether you do or not, what is certain is that you will be able to enjoy a cooling satisfying smoke with this Chongz 22.5cm “Roswell” Alien Pipe. We can tell you that Chongz are a firm favourite here, not only will they ensure a satisfying smoke, the Chongz products offer a , forward thinking, robust and affordable smoking products that are sure to suit the preferences of every smoker. This pipe could be considered to be a classy looking ornament that would decorate a shelf, even perhaps outshining your other ornaments. But, the main purpose of the pipe is to deliver a satisfying smoke and the Chongz Roswell Alien does just that. The bowl of the pipe is situated neatly on the mouth of the alien and the hole through which the smoke is drawn is situated at the back of the head. The head acts as an aeration chamber; this ensures that he smoke that is delivered is not harsh. The pipe is made from high quality green borosilicate glass; the height of the piece is designed so that when it sits upon a table, with dimensions of 80mm width, 120mm in depth, but importantly at 250mm height, it is at mouth level, just right for smoking. ROOR glass pipes have been really popular since they were first introduced here at Shiva Head Shop. These pipes are made from the highest quality silicate glass and are able to withstand higher heat than standard pipes. Hand Blown to ROOR’s exacting standards, the ROOR Steam Roller Pipe is an epitome of design and style. They may look minimalist, but I assure you these pipes are highly efficient and the large glass bowls provide a big hit whenever you need it. We now stock the brand new ROOR Rasta Steam Roller Pipe with sports a red, yellow and green logo instead of the standard white one. They are available in four sizes, extra small, small, medium and large, and complete the ROOR pipe range perfectly. 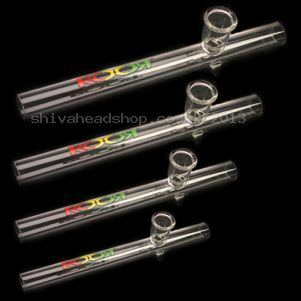 ROOR Rasta Steam Roller Pipes are available now starting at just £20.99 each. Pipes are great! They allow us to have a smoke almost anywhere whilst only carrying the minimal amount of stuff. The ROOR Steam Roller Pipe may look simple, but it’s one of the most aesthetically pleasing pipes on the market. 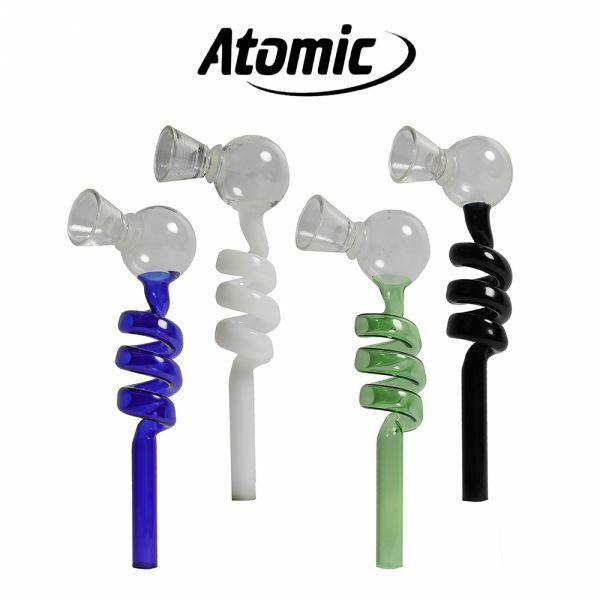 Made from the finest silicate glass, these thick walled pipes are available in four sizes from mini to large and are all uniquely hand-blown at ROOR’s manufacturing plant to the highest specifications. 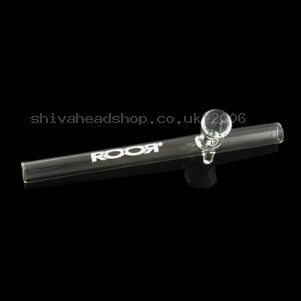 It is recommended that you use pipe screens with these ROOR Pipes and Shiva Head Shop now stock specially designed ROOR glass screens here. ROOR Steam Roller Pipes are available now starting at just £9.99 each and make an ideal gift for the avid pipe smoker. This stunning pipe is made with the highest quality glass and is a highly functional and decorative piece. The Spiral Sit Down Glass Pipe has two built-in feet allowing the pipe to be placed on a table or sideboard making it easier and sturdier to use. The spiral glass chamber not only looks great, but makes the smoke travel for a longer distance, providing a cool and smooth smoke. Using the Spiral Sit Down Glass Pipe is easy, simply fill the bowl up with your favourite herbal and tobacco mixture, place your finger over the shotty hole and light. Inhale through the mouthpiece until you build up the smoke in the chamber then release the shotty hole and inhale. 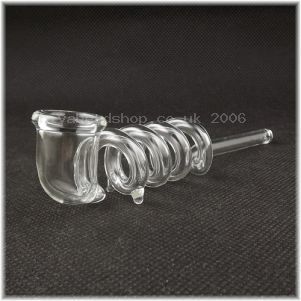 The Spiral Sit Down Glass Pipe is available now for just £13.99 and is a strong and durable pipe that also looks great too. The ROOR Steam Roller Pipe – get yours today! ROOR have been manufacturing high quality glass smoking paraphernalia for many years now and is renowned for making some of the best bongs in the world. Now they use their glass bowing expertise to create a range of elegant, yet practical smoking pipes. ROOR Pipes are hand blown from the highest quality silicate glass and have thick walls making them very strong and able to take anything you can throw at them. The simple design is aesthetically pleasing and easy to use; simply fill the bowl with your favourite herbal or tobacco mix, light and your away! ROOR Steam Roller Pipes are available in small, medium and large sizes, with prices starting at just £10.99. If you are looking for a quality smoking pipe that will last for many years then look no further. ROOR Steam Roller Pipe – simply perfection! ROOR are synonymous with making some of the best glass bongs on the market, and have now used their expertise to product a range of ROOR Steam Roller Pipes. These pipes are available in small, medium and large, and have a simple yet elegant design. ROOR pipes are hand blown in the same way as their bongs and use the same high quality silicate glass. ROOR pipes also have thick walls making them highly durable. Pipe screens are recommended for these pipes, which are a great gift for any pipe smoker and available now from just £10.99. ROOR have been manufacturing glass smoking paraphernalia for many years and is synonymous with quality and workmanship. 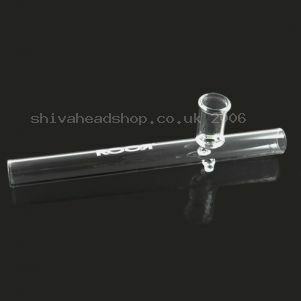 The latest in the ROOR range are the ROOR Steam Roller Pipes which are beautifully hand blown to perfection. The simple and elegant design is a wonder to look at and the thick glass walls give it a sturdy and durable feel. Made from the highest quality silicate glass, ROOR pipes will last a lifetime of smoking and can be heated for longer that standard pipes meaning that you get the most out of your herbs. It is suggested that you use pipe screens with these pipes, you can buy them here. ROOR Pipes are available in small, medium and large sizes priced at £10.99, £14.99 and £19.99 respectively. ROOR is renowned for making some of the best glass bongs on the market and now produces a range of glass pipes. The ROOR Steam Roller Pipe is a great piece of quality craftsmanship and precision design and has already become a though after piece for pipe enthusiasts. Made from the highest quality silicate glass, ROOR Steam Roller Pipes are highly durable thanks to the thick walls and clean lines of the pipe. They are hand blown at ROOR’s workshop and come complete with a glass bowl that can be heated to higher temperatures for longer giving a smooth smoke. ROOR Steam Roller Pipes are available now in three sizes, small, medium and large starting from just £10.99 each. It is recommended that you use pipe screens with these pipes, you can purchase them here.